The Long Format? Sign me up. As I briefly mentioned in my post on Monday, I’ve decided on a new “big” goal for next year. Because it’s fun to set big goals really far in advance. Just like I did last year with AEC. Not nerve-wracking at all. Nope. Not even a little. I have always been a fan of long format eventing, or as some people now call it, “classic format”. When I was first introduced to eventing in the early 2000’s, things were just starting to change over to the short format. My one trip to Rolex in 2000 was when they still were still running it the “Classic” way, and I still remember it vividly. For those who don’t remember or don’t follow eventing, the major difference is that the long format has 4 phases to Cross Country day (called Endurance day) instead of just one. Phase A is Roads and Tracks – basically a w/t/c warm-up of a certain length of time/distance. 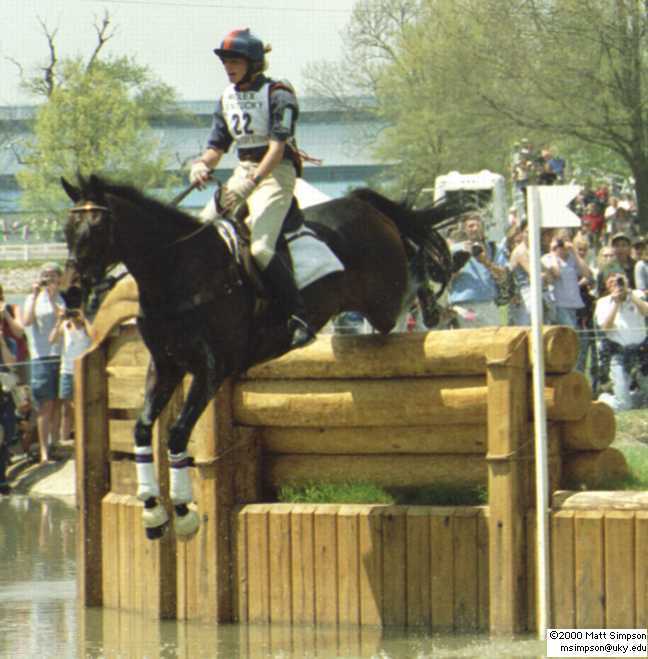 Phase B is steeplechase – galloping at speed over brush fences. Phase C is more roads and tracks – to cool down from Phase B. And then finally Phase D is cross country itself. Phases A, B, and C are concurrent but there’s a 10 minute hold in the vet box – from which your horse must be cleared as being fit to continue – before Phase D.
While the long format no longer exists at the upper levels, USEA (good ol’ USEA oh how I love thee) started a program in 2012 called the Classic Series. This series allows show organizers to offer long format 3 day events at the lower levels – from BN through Preliminary. Right now there is only one Prelim level 3 Day (in Kentucky) and one BN level 3 Day (in South Carolina), but Novice and Training level are more popular. Surely you guys can see where this is going? These Classic Series events are pretty damn cool. They set it up such that it’s more like half clinic/half competition. You have meetings where they teach you how to properly present your horse for the jog-up, what to do in the vet box, and steeplechase practice where they help you learn how to ride at speed over fences. You have in-barn inspections and jog-ups. You have 3 separate distinct days of competition, culminating in a show jumping day run in reverse order of standing. You have a whole ‘nother special dressage test to learn (2012 USEA Novice 3-Day Event Test, I’ve got my eye on you). Until I get there I won’t know what the exact distances and times are, so I have to just prepare for the max. Can my horse trot for 16 minutes straight, gallop and jump for 3, trot another 25 minutes straight, take a 10 minute break, run XC, and still feel fresh afterward? Not right now, no. As you can see, that’s more work than a Novice horse would typically be prepared to do in one day (unless you’re one of those people that does seriously long and intense warm-ups), especially a day sandwiched between a dressage test/steeplechase practice day and show jumping day. Conditioning is the name of the game and the name of the game is conditioning. The idea isn’t just to survive – the idea is to finish endurance day with a sound, happy, healthy, energetic horse that will pass the jog-up the next day and be raring to go for stadium. They should be fit enough that endurance day is easy. Interval work, trot sets, and gallop days have already been a part of our repertoire for a while now. Lately I started adding in long trot days (you don’t realize how many walk breaks you normally take until you set out with the intent of trotting for 20 minutes straight) and longer walk days (seriously, try the snoozefest that is known as walking for an hour) as well… we usually have two “conditioning days” per week. Really we won’t start gearing up for Coconino until late winter, but I like for Henry’s base level of fitness to be higher than what he really needs, and always want him to finish XC looking like he can go around again. I truly believe that a fit horse is a sound horse is a capable horse is a confident horse… tired, fat, unfit horses are more susceptible to injury and error. I think the extra miles and time and work will be good for both of us. There will be schedules to make, legs to ice, hooves to pack, and lots of learning to be done. So there you go. The goal is officially out there on the interwebs now. We’ve got 11 months to plan and get ourselves qualified (just need 3 more completions at Novice) and then get more fit and ready to go. And you know what else long format means? Super important things like jog outfits. ***NOTE: if you’re interested in supporting the Classic Series and long format eventing, visit this site and consider making a donation. All proceeds go to the organizers of classic format events, to help keep them running! Previous Dressage – what the hell is happening? Fun!!! I’m excited to see how planning goes. I watched a training long format at the KHP and it was intriguing. Looked tough though! Good luck! And you should consider the CO event as well! I’ve done Summer in the Rockies at the CHP and it’s amazing! Love Colorado! I would if the weather was guaranteed to be a little cooler. Mine does so badly in the heat that 10 degrees makes all the difference in the world. Very cool! This sounds like a lot bigger challenge and a better test of true horsemanship. You. are. a. Rockstar. Love it. Ohhh.. this sounds like a lot of fun! I’ve always wanted to jump a steeplechase course. And I’m equally excited about your jog outfit, because you have a reputation to uphold. Holy crap! I am guessing unicorn jog outfits may be out the window, but still. The epicness that this will become is mind blowing. I’m excited for your jog outfit! Will be navy and yellow? Sparkles? OH THE OPTIONS! We’ll talk about it tomorrow. 😉 I’m already looking at options though, I have a basic idea. That’s so exciting that you are planning to do that, and it’s awesome that you get a jog outfit! I didn’t know the Classic Series was a thing but that is AWESOME and super super exciting. I want to do a 3 day sometime “soon” here too!! There are a few in California so we have options. I really want to do the half-star at Waredaca that they run as a long format (it’s like training level). Not the 2016 season, but the next year, I think Mo can do that. This post was making me so tired at the thought of doing roads & tracks, steeplechase, and xc in one day until I read “jog outfit” and it was a jolt of fashion caffeine. OMG, I want to try one, too!!! What an awesome thing for these organizations to be keeping the long format alive! I’m excited for you – if anyone can do it, you and Henry can! So cool that you are doing this. I’m excited to read along! This is awesome. If you need a stopping point in Albuquerque, be sure to let me know! Great goal!! You guys will totally rock it! I’m also looking forward I reading more about your plans for conditioning and fitness. This sounds AWESOME. My endurance mind loves it.